What should we bring with us on our fishing trip? Please refer to our What to Bring page. Saquatucket Harbor Marina is located on Nantucket Sound in Harwich Port, Massachusetts. Please go to our Location page for driving directions. What time does the boat depart? The starting time changes daily due to tide. We will confirm starting time upon booking your charter. Will you clean our fish? What if we don’t have our own fishing gear? We provide all fishing gear. What fishing regulations do we need to know about before we arrive. Please see our Regulations page. Kids are welcome! There is no minimum age, so use your best judgment. We have life jackets for kids, but if you have one that your child is comfortable in, that is a bonus. What kinds of fish will we catch? 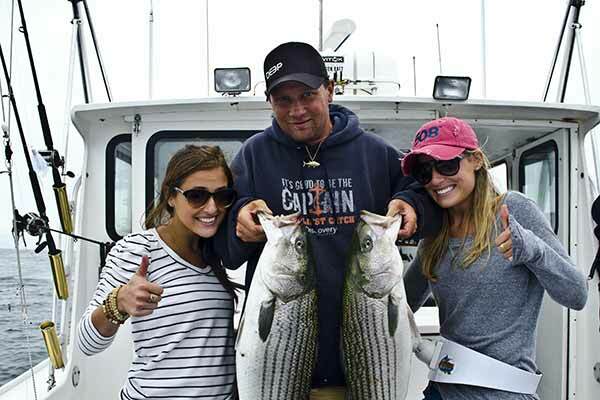 The types of fish that you catch will depend on the season, but may include Scup, Sea Bass, Flounder, Taotog, Striped Bass, Bluefish, Bluefin Tuna, and Shark. See our Rates page for more specific information.